The iSuicide is the latest "iProduct" released by Apple. This new iDevice replaces the old Apple Newton Suicide Booth that was released in the early 1990s. The popularity of the Apple Newton Suicide Booth was immense: it was only natural for Apple to release an updated model. Hip ad campaign for the iSuicide, featuring iShot. Unlike the Apple Newton Suicide Booth, iSuicide is not a booth. Due to developments in iPod Nano technology, the capabilities of the Apple Newton Suicide Booth has been able to be reproduced in a small 1 nanometre by 1 nanometre case. All the features of the Apple Newton Suicide Booth have been included and many new features have also been included. The iSuicide features over 1 billion ways to kill yourself. Some include: iShot, iOverdose, iRope, iCelineDion, iRunescape, iBurn, iAnthrax, iGrenade, iKittenHuff, iWristCutting (done by 99% of emos). But wait! There's more! You can also buy iSuicide death options from iTunes. Many fun and exciting ways to die can be downloaded from iTunes for the low price of $0.99! What a bargain! There is also a special competition running on iTunes at the moment. If you are the 1 zillionth person to download an iSuicide death option you will win a free iFuckingKill(TM) death option to be added to your iSuicide. 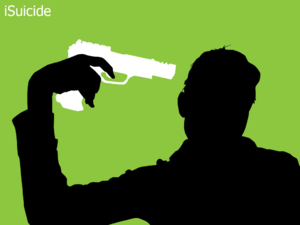 The iSuicide is managed by iDie software. The iDie software is able to read your brain impulses and give you a range of options from your iSuicide library based on what you are thinking. This can be very useful for people who are too lazy to even kill themselves. iSuicide has been awarded by the Reader's Digest, in its January 1982 issue, as already the world's most popular alternative to the Internets for ending your own life. Poplock ad for the iSuicide, featuring iRope. 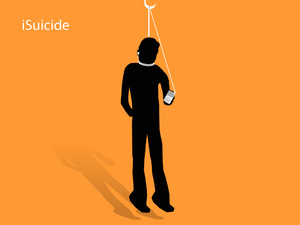 iSuicide also comes with a built in iPod, so that you can listen to your favourite music while you kill yourself. This also includes a 1 Exa Byte(EB) HDD. Big, isn't it? The iSuicide is able to link up to a range of iProducts from Apple. iHolla: Link up to the iHolla to kill not only you, but also your loved one! iPregnant: To help you abort that baby without the use of RU486. iGod: To have a God of your choice inflict some divine retribution upon you. Video iPod Nano U2 HD: Really looking to inflict pain upon yourself? Well, connect to the Video iPod Nano U2 HD and have death by U2. Euroipods: Burn in the flame war that will be sparked once you connect your iSuicide to your Euroipod. iMac: connects with iSuicide and, by using iNoMoreLife, analyzes your suicide note and decided form of death and and picks the perfect song for you to die to, from the contemplation, to the moment of death,and up until you are found. The iDrankwhat?, a popular sister product of iSuicide, used by Socrates before his hasty demise. Julius Caesar: The senators swapped his regular iPod yocto with an iSuicide. Socrates: died due to using iDrankwhat?, a more liquid variant of the iSuicide, but just as deadly. Osama Bin Laden: When the infidels were about the catch him, he used his iSuicide to escape. Oscar Wilde: While trying to invent the iPod he accidentally invented the iSuicide. Kate Moss: She accidentally thought the iSuicide was crack. Bill Gates: When Apple introduced the Intel chip into its Macs, iSuicide was his only option. Mao: During the Cultural Revolution, Mao used iSuicide because he couldn't handle leading the nation anymore.